Origin and Habitat: Nolina longifolia is found in Mexico in the states of Oaxaca and Puebla. Type from San Jose del Oro. Altitude range: 800 to 900 metres above sea level. Habitat and ecology: In grows in open seasonally dry forest. It is associated with Dasylirion species. 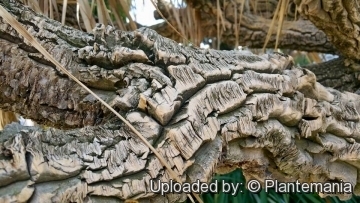 Description: Nolina longifolia is a woody, slow-growing plant which becomes arborescent with time and develops a curious, massive base to its 1 to 3 m tall stems. It produces long, pliable leaves hanging nearly to the ground. It is not nearly as popular in nurseries as its cousins Beaucarnea recurvata. The primary difference is in the thick, corky and deeply fissured bark and in the 50 to 250 cm long by 10-30 mm wide leaves. Derivation of specific name: “longifolia” Latin meaning "with long leaves". Stem: Juvenile plants are single-stemmed with a bulbous base that start thickening at an early seedling stage, forming soon a neat, firm, rounded caudex and the small plants are pulled underground by contractile roots. Mature specimens produces a stout caudex up to 3 meters in diameter, most of which is above ground, with one or more branched trunks 1 to 3 metres tall. Leaves: Soft green, drooping, 50 to 250 cm long by 10-30 mm wide. The leaves are finely serrated. Inflorescence: Irregularly branched 1 to 2 m in height. Flowers: White 1.5 mm long and in diameter. Fruit (capsules): 8 to 12 mm long. Seeds: 3-4 mm in diameter. Similar species: N. longifolia is similar and often synonymized with Nolina parviflora, but N. parviflora has bracts a little longer, (up to 50 cm). On the other hand the leaves of N. parviflora are more erect, while those of N. longifolia are arched, wider, very long and once the plants form a trunk will weep to the ground. However most authors believe that these evidences are not sufficiento maintain N. parviflora and N. longifolia as distinct species. More likely they are one and the same species. 4) CONABIO. 2009. “Catálogo taxonómico de especies de México”. 1. In Ca. nat. México. CONABIO, Mexico City. Cultivation and Propagation: Nolina longifoliais seldom seen but can be an attractive plant in a group. It is resistant to temperatures of -8 ° C. It is used as an ornamental plant, similar in habit to Beaucarnea recurvata (Pony Tail palms), it is among the easiest “palms” to grow indoors as a houseplant, and outdoor as an ornamental plant in temperate climate gardens. 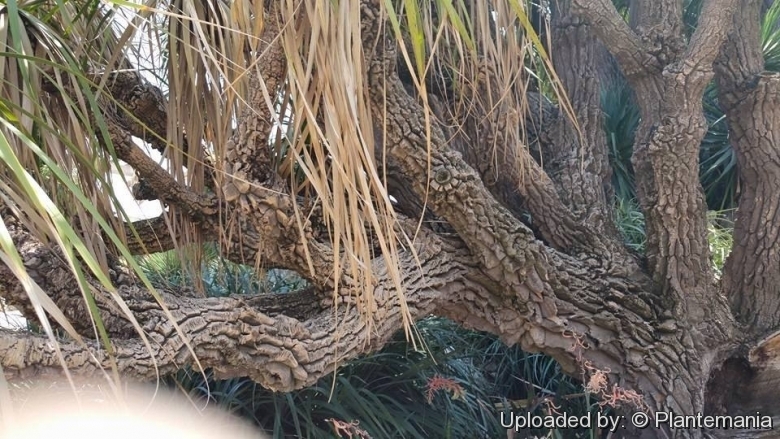 The plants are very slow growing, so don't expect great growth spurts from year to year, but s it gets older it forms a trunk and a swollen base like a pony tail palm. They are very drought tolerant, give them lots of sun to light shade, well drained soil mix and water deeply but infrequently in summer and fertilize them only once during this period. During the winter months, the plants are watered only enough to keep the foliage from wilting. Over-watering is the most frequent cause of failure when growing these plants. They are pretty resistant to rotting if all other conditions are good. Indoors they are often grown in shallow pots, with a tuft of strappy green leaves emerging from a bulbous stem that seems to erupt from the soil. It is a plant for people who don't want a lot of work taking care of their plants, as it seems to thrive on neglect , and indoors are manageable in size if kept in a small pot but need a good amount of direct sunlight through the window. The plant is quite hardy and can even stand frost (-8 C). Pest and disease: Bugs, mealy bugs and mites usually are not a problem , however if they do appear, simply spray the houseplant down with a soapy water mix twice a day until they are gone. Propagation: Seed is sown in the spring and will germinate at about 20° C.
Use: It is often used as specimen container plant, near patios, or placed in rock gardens for its irregular outline or silhouette, or as a spectacular group planting. It is also suitable for growing indoors.